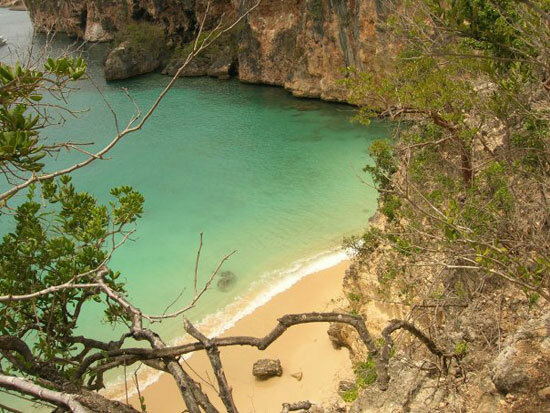 I am including the magical Little Bay in the Anguilla Beaches Walks since it technically does have a beach. That said, the beach is small and you have to make an effort to reach it. 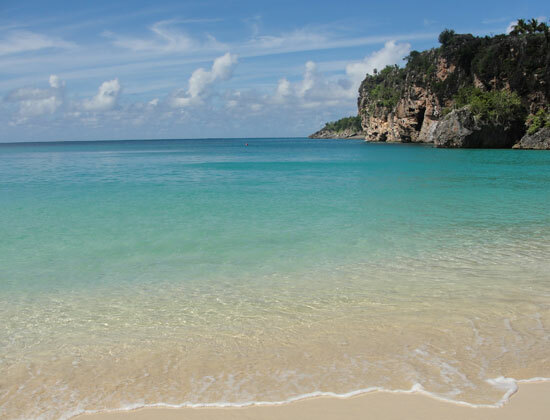 That effort is well rewarded, as Little Bay is one of Anguilla's most special and serene places. I will never forget the first time I saw Little Bay... Azure waters, an unspoiled spit of shore, surrounded by high cliffs. It is right out of a post-card. There are two ways to get to this most remote beach... 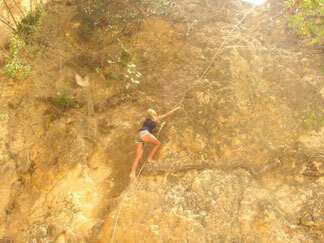 Climb down by rope, or boat over from Crocus Bay. 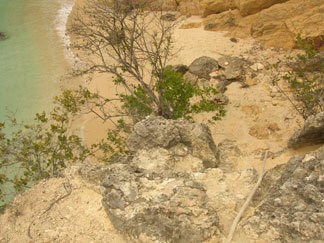 You will need to be an adventurous person to appreciate the climb down to Little Bay. The rope marks the way down! First, you have to find where to walk through to get to the top of Little Bay. You can follow an Anguilla map to see roughly where you will need to drive to. You can pass through "Roaches Hill" to get over to the top of Little Bay via car. Use the map below as a rough guide for directions (pin marks Little Bay). Follow the road before da'Vida, heading East. Stop driving when the road curves downwards, and there is a thicket of bush and trees on your left. Parking will be found wherever you make it. Then wander through just a minute of bushes/trees in the direction toward the sea and look around. You should be able to look down to the alcove that is Little Bay. The "way down" and rope are on the western side of Little Bay. Tip: Be sure you have everything you need in something you can hook on your back since you will need 2 hands to maneuver down to the beach. Tip 2: Do bring things with you! There is no way to get water or sunscreen if you leave it behind. Looking down from where the rope starts is a little intimidating the first time but also very exciting. I was happy that my friend who I was adventuring around Anguilla with was experienced and he suggested that I actually not use the rope and just use my hands and feet. As I started down, I realized what he suggested made good sense. He noted that I should only use the rope if I needed it - it was there as an aid more or less. I had flip flops on and I chose to take them off for the descent. I could feel the rock better under my feet that way. This is me going back up. It was easier going up than coming down. When you reach the bottom the first time it is breathtaking and unreal when you stop and look around. 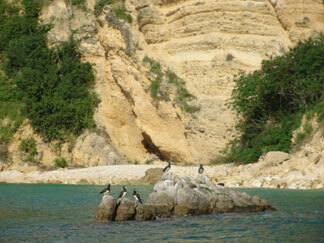 You are almost fully surrounded by this beautifully layered limestone with all shades of corals and grays. The sand on the beach a lighter contrast to the stone and then there is the glowing, brilliant blue of the sea. No wonder the Anguilla flag colors are orange, white, and blue. It must have been inspired by Little Bay! 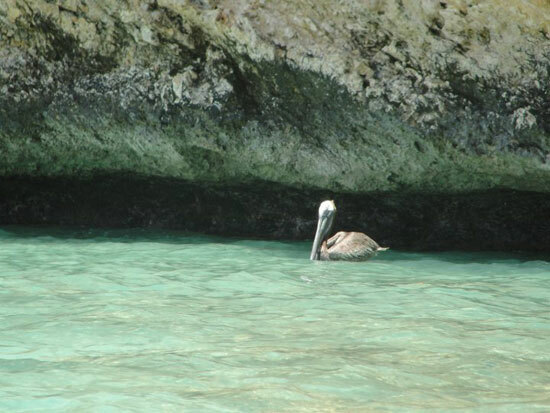 Look out and witness the pelicans flying from cave to sea and back. What a place to live! This place is one of a kind and if you are lucky, it could be all yours for the day. Since Little Bay isn't super easy to get to, chances are there is not going to be a large amount of people there on any given day. This is considered "a crowd"
If you are using a boat and can make arrangements to stop off at Little Bay, you should! Nori highly recommends going aboard Gotcha! Anguilla charters. 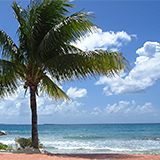 Otherwise, if you want to see Little Bay and the rope and climbing sounds more like a beach deterrent to you, then opt for a boat and you will still get to experience the wonder of Little Bay without the risk. 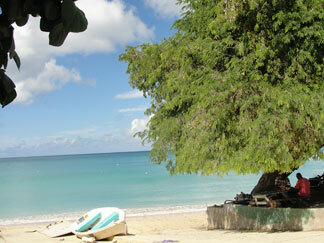 The simplest way to do this is to drive to Crocus Bay, the same beach where da'Vida is located. Park just before da'Vida and look around for a guy named Calvin. He is usually sitting under the big tamarind tree where a few locals tend to play dominoes. If Calvin isn't around, he has a sign posted nearby with his number on it. Give him a call and he should be able to get there quickly. 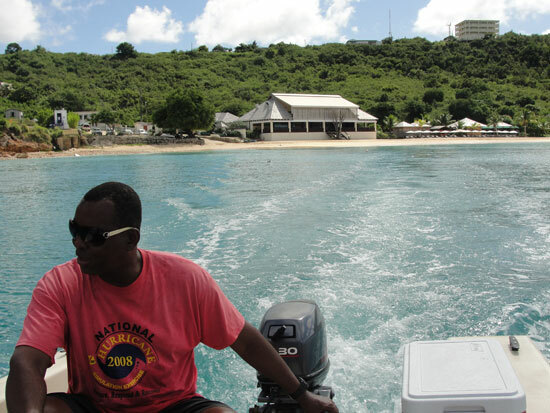 Calvin driving us over from Crocus Bay. That's the amazing da'Vida in the background. Calvin charges $15 US per person, round trip. He will take you over and come back when you tell him to. He takes that part very seriously too! He's always back right when you tell him to be there. It a quick enough ride over as Little Bay is the next bay over from Crocus. You will pass by the Pelican Trail on your way. If you don't have your own boat and don't want to use Calvin, and rather use your own muscle to get there check with da'Vida's at Crocus Bay. da'Vida's rents out some kayaks so you can get yourself over to Little Bay. 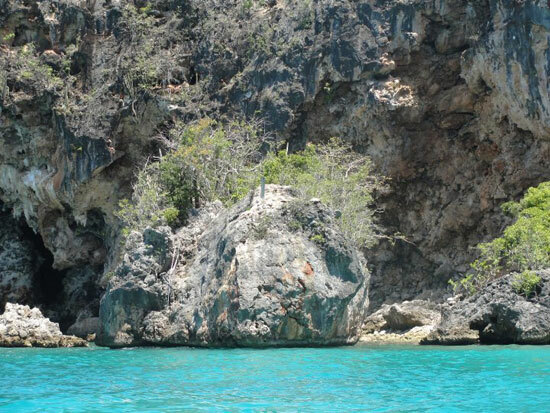 All you would need to do is to hang a right around the eastern end of Crocus Bay and you will be on your way. Note: da'Vida's also rents out snorkel gear which is a high priority for most who visit Little Bay. Granted there are no beach chairs or umbrellas, so if you opt for nothing, you are likely to be doing nothing on your own towel. If you are not up to lazing in the sun or just wading in the water, a couple other options exist. There is a rock that many choose to jump off of. It seems to be called "the rock" and yes, I have jumped off of the rock! The rock is to the north east if you are standing on the beach. You will have to swim to it. If you are visiting Little Bay via boat, your boat is likely moored close to where the rock is and you will have a shorter swim to the entry spot on the rock than if you were coming from the beach. For me the challenge of the rock was getting on to it in the first place. It does look like it's sitting on the water but where you need to get footing to push/pull up on to the rock is under the water and sometimes covered with some spiny black urchins so lookout for those! My first time experiencing the rock, my friend helped give me a boost. It worked! Climbing up the rock seemed shorter and not as steep as the rock climb path you take to get down in to Little Bay. My friend and I making our way up for a jump. Again with the rewards of this special place... The view from the top of the rock is amazing. The way you stand to jump is in the direction of the setting sun so it is quite a sight if you are there later in the day. I've heard and seen many who plan to jump off, do the work of getting up to the top and then chicken out. It really does seem to me that it would be more difficult to come back down the way you came up vs. jumping. Why do people chicken out on the rock? My first guess is that the rock curves out so much that people feel like they will hit it on the way down. Jump far and you will certainly not hit the rock! My friend gave me proper direction before we even got on the rock... I understood that I needed to jump "out," didn't stall too much, then went for it. Proper instruction includes to jump out and then let gravity do the rest! It's plenty deep at the bottom. My friend jumped twice, once feet first to show me and then he did a nice dive. It is a must-do if you are physically able! 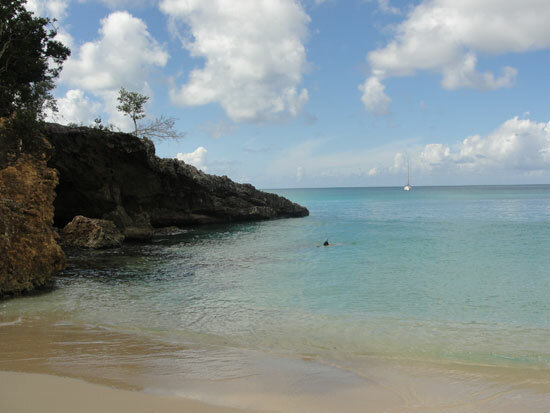 The rock is a highlight for sure but the most popular thing to do at Little Bay is snorkel. You'll hear about the great snorkeling at Little Bay. You can snorkel and not see much in a day and then you can snorkel and see turtles and gorgeous fish. I think it just depends on how your luck runs that day. What's fun about snorkeling at Little Bay is that there are lots of nooks and crannies for nice little creatures to be hiding in. You can snorkel all along the rocks on both sides of the bay and even go on around the corners if you feel like it. It's usually pretty calm within the bay since it is somewhat protected. Thankfully this spot stays protected in every way due to its remoteness. 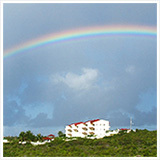 It is a special place and the ideal spot to spend an afternoon in Anguilla. No picture of Little Bay does it justice... It's one of those places you just have to see for yourself.